Last year in Niger alone, Disaster Relief agencies, treated 300,000 children for severe malnutrition. Agencies garnered the figure before the onset of the so-called hungry season. As a result of extended drought, the hungry season has come early, due to, among other things, crop failure causing the depletion of life-sustaining herds. UNICEF estimates that, across the Sahel, one million children under the age of five will need lifesaving aid. Once again, Africa is facing catastrophe. What this means in real terms is a whole generation of children will have their physical and mental development irreparably damaged, due to not having enough to eat. Recently, G8 leaders gathered to discuss world economies. As an aside, they added the situation in Sahel to their agenda. As they feasted on the finest imported foods prepared by the finest of chefs, it was difficult not to draw a comparison to the women of Sahel grinding maze for payment in husks, with which to feed their children. 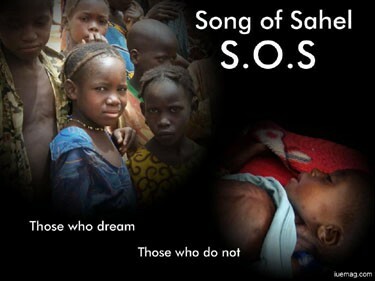 Starvation and drought is a silent earthquake, a secret plague that happens in Sahel year on year. Some years are worse than others. The consequences of chronic malnutrition for young children are terrifying. Apart from the risk of early death, childhood immunity is under attack, its strength further reduced. Niger is already a high risk area in that disease is rife. If a child survives, growth might be stunted, cognition impaired. Hunger steals a child's opportunity for education: the one empowerment for future citizens to make their way in the world and become successful contributors to society. How can a starving child concentrate in the classroom? S/he becomes too sick and tired to go to school, too weak to learn, having fed the evening before on bitter leaves or millet shavings usually fed to animals. To make matters worse, neighbouring country Mali is at Civil war. Refugees are pouring across the borders into an already starving, food insecure area. Are we listening? Do we care, or are we, as a globe, suffering from compassion fatigue? Malnourished children do not cry out; they die in silence. One of the reasons I founded Plum Tree Books, a new initiative to bring writers, artists, musicians, photographers and poets together, and include the greatest muse of all: children, was to produce books about the causes that concern us. Through the written word, we hope to give voice to the voiceless.